The beginning of the year marked a release of a new book, “A Latvian’s home”. The author of the book, Janīna Kursīte, is well known in Latvia as a literature specialist, folklorist, linguist and a writer. Apart from being passionate about language and the written word, she is also passionate about wooden architecture and wooden houses. Since 1999 the writer has gone on many expeditions near and far; her travels have led her to homes of Latvians in Russia, Belarus and the West. Janīna believes that a home tells a lot about the person living in it. The folklorist shares her impressions on how a Latvian is revealed through his home and what exactly are the main aspects of a typical Latvian’s home. Janīna also speaks of the common characteristics of homes in the world altogether. We invite you to discover the fascinating world of traditions of wooden architecture in Latvia and Europe, to learn about the significance of a home in a person’s life (wherever in the world that might be), as well as to get a deeper understanding of a Latvian’s home and culture that defines it. In your opinion, what is the significance of a home in a person’s life? A home is a shelter – both directly and symbolically – to oneself and the ones that are dear. There is a reason to why, in the days of past, homes were built like small fortresses – with tiny windows or windows facing to the courtyard, with high fences or off the path. To find your home also means to find yourself. You have been working on your research for many years, and the book, “A Latvian’s home”, is its embodiment. What would you describe as the purpose of your work? I dare to say that it is the Song of Songs to our wooden architecture. I have been writing this book like a swallow makes its nest – layer by layer. The book has over 20 chapters. Being a folklorist, it was important to me to show the building of a home as a creative process; a builder’s handicraft used to be considered an honourable one. Even a simple farmer possessed the knowledge of a builder, knowing how and when to work the wood properly; he also knew the magic symbols of protection and where to carve them in the different corners of the house, including under the doorsteps; these symbols strengthened the building and protected its dwellers. I have also studied the layout of buildings in a Latvian farmstead and what types of trees were planted around these buildings. I was looking to find out how did the unschooled farmers learn to design their homes. Nowadays we have highly educated architects, but the safety of buildings has remained about the same. A big portion of the book is dedicated to the Lettic nature of the farmstead. I also describe at length the different settlements of our ancestors. Latvians have always preferred living in individual farmsteads; I have been looking to find answers to why has it been that way, and whether it is a positive or a negative aspect. Your work specifically speaks of Latvians and a Latvian’s home; have you discovered a common characteristic that describes the feeling of a home, regardless where in the world it is? A Latvian’s home is not a unique concept. Generally speaking, wooden architecture, at least in Europe, is rather similar, and the only differences are subtle – in colours, adornments of windows and doors (be it is geometric or nature or animal kingdom inspired) and other various minor details. 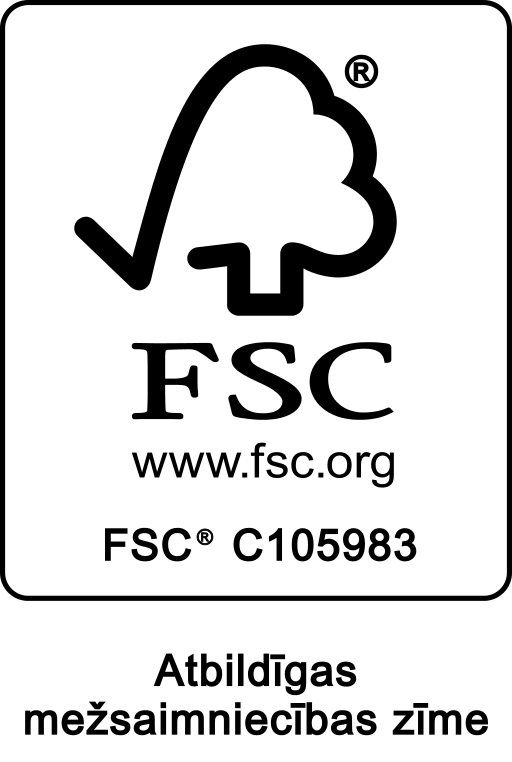 The common trait is the ancient belief that the wood is not only the continuation, but also the beginning of all people. Women are likened to linden trees and men – to oaks. Such analogies are rooted in totemic beliefs that certain trees are the forefathers of tribes or the different genders. Other nations have shared similar beliefs, too. Your research is focused on wooden houses. What draws you to wooden architecture? Wood has a soul; no other material, be it concrete or brick, has a soul. Wooden architecture is rich in nuances, just like Dainas, the Latvian folksongs, or the splendid fairytales. What is the value of wooden architecture? Do you see people having an appreciation for wooden architecture? The value lies in its trueness to nature. 20th century man leaped in the synthetic material world with great gusto. Surely, these materials have their advantages. But, as the 21st century rolls around, we have come to learn about many great disadvantages of these materials. It is a common belief that the touch is one of the oldest means of communication. As the Italian poet Marinetti wrote at the beginning of the 20th century: “Sight came to being through the tips of fingers.” Meaning – we truly see through touch, not eyes. We can love a person with our eyes, but the love reaches greater depths through touch and contact. Same applies for wood and plastic. The wood sings, it is warm to the touch and it has a rich texture. Plastic does not sing, it is soundless, resonating with a hollow thud. Plastic has no warmth. People have always associated warmth with life, shelter and security. Slowly but surely, like a tip of Atlantis, wooden architecture in Latvia is emerging from the deep waters, shining in all its once-forgotten glory. You have mentioned that with the completion of your book you also realized that a Latvian’s home is the Latvian himself. What is the meaning of this statement? What do we see when we travel around Latvia? Beautiful, old buildings that have been disgraced with plastic windows from the 90’s. The scenery has been made lifeless and gray with slate from the Soviet times. The diverse wooden fences that used to be so vibrant with character have been demolished or have rotted away, making the division between the road and home non-existent. We see fierce signs warning of ferocious dogs and electronic security. Does it mean anything? I believe it does. Firstly, we have not regained our self-assurance; we imitate others without a second thought or consideration of our ancestral experiences. Our wooden architecture is excellent. Yes, it begs for thought-through renovation, but abstaining from the pollution of artificial materials. Secondly, throughout the past the surroundings of homes were not chosen randomly or on blind whim – these locations were chosen based on wisdom passed down generations over centuries. Thirdly and lastly, we complain about sicknesses, ill spirits, aggressive feelings in ourselves and others, but we do not realize that it all comes from the unhealthy surroundings that we have placed ourselves in. The scenery of our countryside houses tells us that we need to bring order to our homes, which, in return, will bring order to our inner worlds. What kind of Latvian did you discover through his home? Whenever given the chance, a Latvian has built a home in an individual farmstead. At the end of the 19th century and the beginning of the 20th century the land in Siberia and Belarus was cheaper than in Latvia; the Latvians that moved to these lands back then kept distance between homes as they were building them. Neighbours were necessary, but were laid in an appropriate distance. When individual farmsteads were eliminated with the dawning of the Soviet Russia and the farmers were forced in collective farms in the 1930’s, it was a tragedy. People had a hard time adjusting to living in villages, and a certain burning flame in their souls withered away. Despite all attempts to create collective farm centres and rural villages in Soviet Latvia, the results were less then inspiring; even those in soviet power admitted so themselves. In places where these attempts were successful, even after all these years people still have not regained their lost sense of home. How do you explain the fascination with wooden houses that our Latvian forefathers had? Why are wooden houses only gradually regaining their former significance? It is an expression of our survival instinct. Surely, many of us have to live in urban apartment buildings that are anything but wooden houses. Even a considerable portion of the rural population has to live in buildings that are not necessarily made of wood. Once given the opportunity, a person is subconsciously drawn to a wooden house. What are the highlights of your observations while writing the book, and how would you sum up the main characteristics of the environment of a Latvian’s home? Balance, excellent sense of proportions, simplicity of shapes. 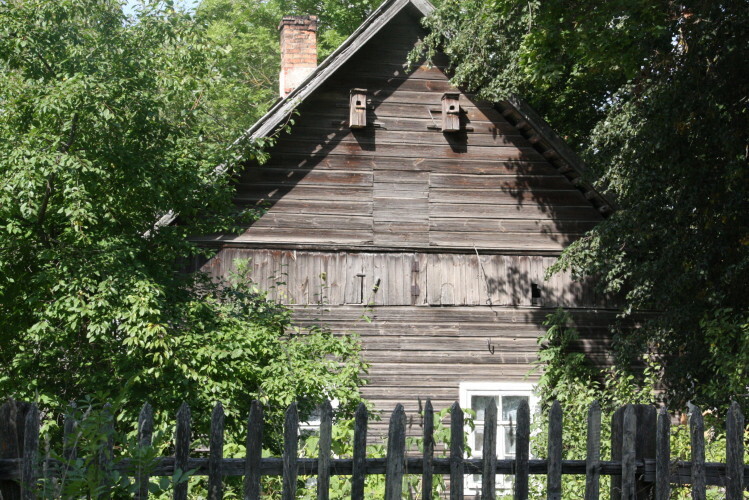 A house in Rūjiena. 2009. What are your observations on colours of a Latvian’s home? The older homes were built maintaining their natural wooden colour, but the light, yellowish tones slowly turned greyish. The same happened to straw and shingle rooftops. The flowerbeds served as an accent colour. Accent colours in buildings slowly made their way first through design patterns on barns and doors of the house; only later we see these elements on the outside or inside of the house. Soothing, warm colours have been a typical choice. You speak a lot of our forefathers when you describe how the design of the facade of the building is highly influenced by the dweller’s ethnical, religious or regional background. Do similar observations apply when speaking of the modern Latvian and a Latvian’s wooden house? 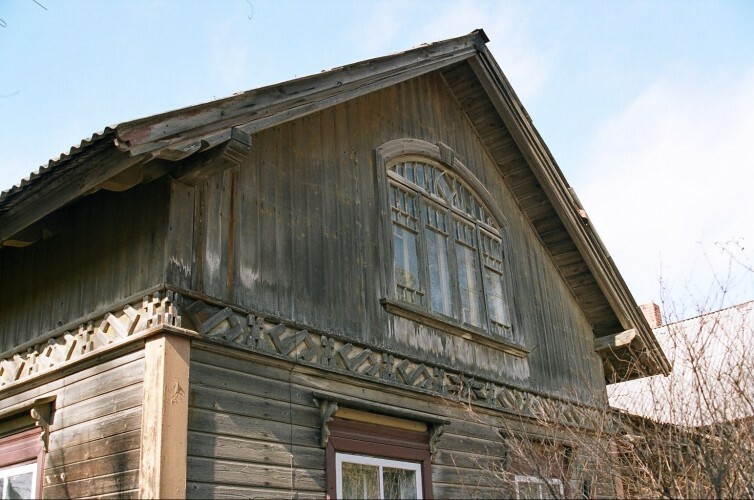 Although Latvians moved to Siberia more than a century ago, the yellow and brown colouring of a Latvian’s house can still be distinguished from Tatar’s blue-green or Russian’s and Ukrainian’s blue-yellow colours. Can it be considered that a home is the mirror of one’s inner world and the understanding of the universal order? Our home from the outside is how we wish to present ourselves to the world and others, but the inside of the house does, indeed, mirror our inner world. You can tell so much about a person just by entering the person’s home (if you are invited in one, of course) – more than the person could ever tell you even when talking about him or herself for hours or days. Do you believe that a wooden house belongs in a city? A wooden house beautifully fits in a city; although, maybe, not the city centre. It is like a privilege that men and women in power in Latvia are not too keen on, considering the limited city space. I am not entirely sure that people living in wooden houses in Rīga or Liepāja or any other city actually comprehend how fortunate they are. I see the slow and thought-through return of wooden architecture as a positive tendency – campaign-induced trends leave just as fast as they arrive. As it is well known, all good things take time. What advice would you give to anyone that is considering building a home? The choice of the name of the home is very significant. I have dedicated a whole chapter for this topic. To give a euphonic yet barren name to one’s property is the equivalent of laying crooked foundation. Keep it pure, don’t over-exaggerate it. Simplicity bears its elegancy. Perfection lays in fine details, such as in carvings around jambs, patterns on doors, colours and the surrounding area (e.g. flower garden and trees around the house). The book has a chapter on happiness and sense of home. Is a home a part of feeling happiness? It is a very important aspect of happiness. People say that one can live anywhere as long as the beloved one is by one’s side – be it in a tent or under the open sky. Temporarily – yes, it is possible. But a fulfilled happiness requires not only a loving family, but also a roof over one’s head.